The Islamic State’s (ISIS/ISIL) invasion of Iraq has left 90% of the nation’s Orthodox Christians displaced, fleeing religious persecution and ethnic cleansing, according to Ghattas Hazim, Greek Orthodox Bishop for Baghdad, Kuwait, and their surroundings, who must now travel into that territory and unite his congregation. In an interview with Al Monitor, Hazim confirmed that current estimates of Christians belonging to his congregation in Iraq have reduced dramatically, with 90% of them being displaced from their homes. Islamic State terrorism and religious persecution have forced some to flee; others have begun to move, expecting their fate to be similar to those already in ISIS-conquered territory. In Baghdad, he said, only 30 of 600 Christian families remain, while in Mosul, which is widely believed not to contain any Christians who are not elderly or otherwise unable to move freely, it appears that fewer than ten Christian families remain. 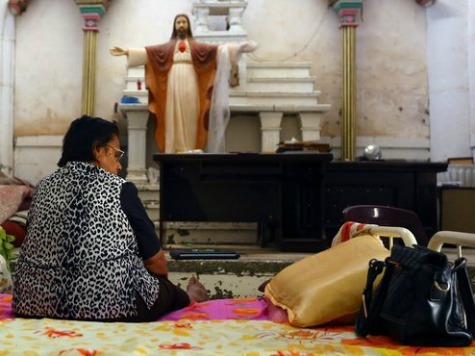 Basra reportedly is not home to a single Christian anymore. The Christian communities of Iraq have been under siege since the rise of the Islamic State terror group in the nation, after a number of pivotal defeats of the Iraqi army. In July, Patriarch Louis Raphael I Sako of the Iraqi Catholic Church warned that Islamic State violence may lead to “the very dangerous elimination of the possibility of co-existence between majorities and minorities.” By the end of the month, the Islamic State had captured Mosul, the second-largest city in Iraq, and forced all Christians to accept death, exile, or conversion.